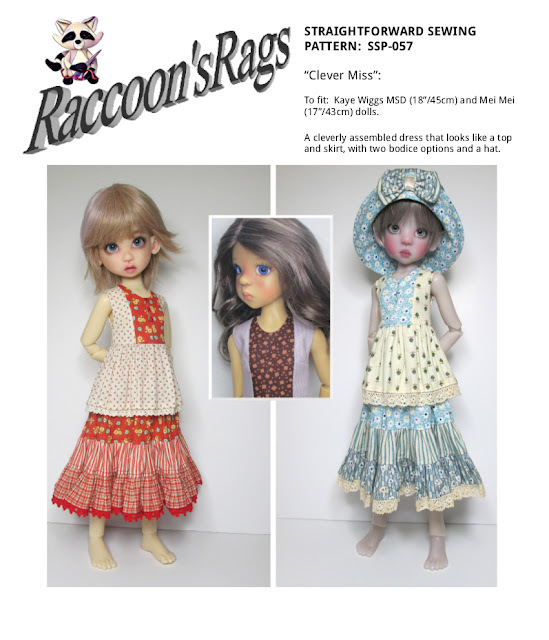 Raccoons Rags: SSP-057 New sewing pattern for Kaye Wiggs dolls. SSP-057 New sewing pattern for Kaye Wiggs dolls. After finding some amazing designs on Pinterest, I've been dying to make something in mixed prints. So here's the first idea. It's a tunic over a skirt... or is it? Nope, it's an all in one dress. If you do buy from me here on the blog, and you live in the EU, the rules state that I don't have to charge you VAT as it's a direct sale. Once you have cleared checkout, I will email the pattern files to you directly. Please allow me 24 hours, because of time zones. Usually it will be far quicker than that. You can find the sales pages at the top of the blog, in tabs for each section. I will email you the pattern PDF files directly, after you've cleared checkout. Click this link to email me, if you have any queries. EDITED: I have been working on my files to try and consolidate the tutorial parts and pattern template parts, to create just one document that is neater and easier to download. There are still two paper sizes, A4 for Europe, etc, and US Letter size for the States. You will receive the pattern in the new format. As usual, this will fit both the 17" and 18" MSD sized dolls. Here's my inspiration pic. I LOVE Nadir Positano. So inspiring. I designed my own fabrics around it, had them printed by Prinfab, and made up the initial design. Modelled here by the lovely Gracie. Yes, it's a bit different, I didn't actually want an exact copy. I like the way the dress combines both layers of skirt and tunic. I find sometimes that a skirt under a dress on these dolls slides about a bit. I then made up another version from my brand new stash. I'm loving these prints together. I want to do a ton of mixed-print outfits, I find them so bohemian and fun. There are also pattern pieces for a plain centre panel on the bodice. For those who find the bead-buttons a bit daunting. You can also use the V2 bodice lining fronts to make a very plain bodice. Here's a close-up of those hand-stitched buttonhole loops and beads. I published shots of an impromptu hat I made, with a large bow, on Facebook recently, and several people asked me for the pattern, so it's included in the pattern. So that's it for now. I'll be having a bit of a break, now my benefits have been reinstated. Not a complete break, but patterns will be a bit slower in coming, as I'm doing a couple of collaborations with the wonderful Dr Krowe. Very nice - Gracie's modelling beautifully as usual - I love the fabrics in her dress! Very clever as it's looks like a top and skirt and I love the inspiration! I found a load of inspiring pic searching for Nadie Positano on Pinterest. They gave me so many ideas. Thanks Trish! :) Gracie says hi. Loving the way you mix and match fabrics in such a natural way - when I try to do it, it always looks a bit forced! It's great that your benefits reinstatement allows you some breathing space - you deserve a break! I know you're something of a workaholic but the pressure must have felt crippling at times. It takes me a while to play with fabrics and decide, but when you do it, it probably doesn't look forced to other people. I always look at my mixed prints and fret over whether it works or not! Oh gods, yeah. The pressure has been a bit much, I've been treading water for two whole years now!